I got stuck. 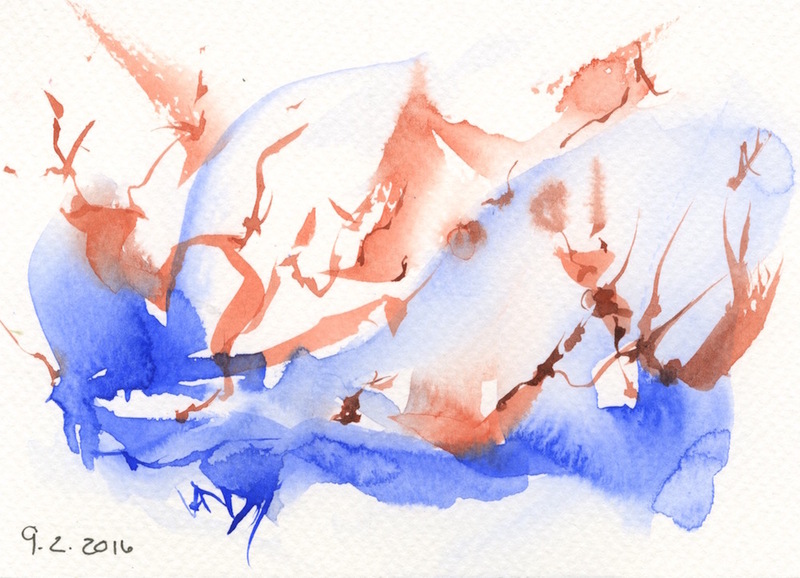 My painting wasn’t going anywhere special – so I started a watercolour marks project. I’ve been wanting to develop a more abstract approach to my painting for some time. After being away from my studio for almost 4 weeks in December and early January, my mojo didn’t come strolling back when I picked up my brushes as I expected it to. It was well and truly on holiday with no intention of coming back. So I patiently pottered in the studio whenever I had time. I mixed paint from pure pigment and started trying it out on a set of cards. I tidied. I bought a few new books for inspiration and information. Finally, I gave up waiting for the painting motivation to reappear spontaneously and decided to get stuck in to a project making watercolour marks. 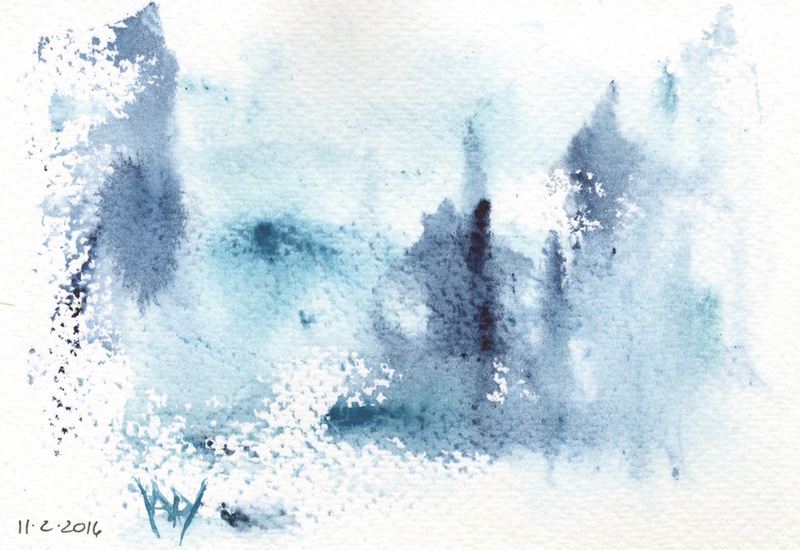 And yes, before you say it – that is pretty much a description of watercolour painting. The distinction is the difference between playing (experimenting) and taking a more focused approach to creating a completed painting. I was having a conversation with Noel Gray on Monday. He mentioned in passing that he’d just squashed his dinosaur. (Not your average business conversation!). What he meant was that he had squashed his origami dinosaur and would have to repair it. And there we had the start of my watercolour marks project. I had a mental image that had to be captured. I decided to take a journey towards abstraction. I define abstract paintings as those which are paintings ‘about’ the subject rather than paintings ‘of’ the subject. That could mean capturing a quality, an essence, a thought which is sparked by the subject. 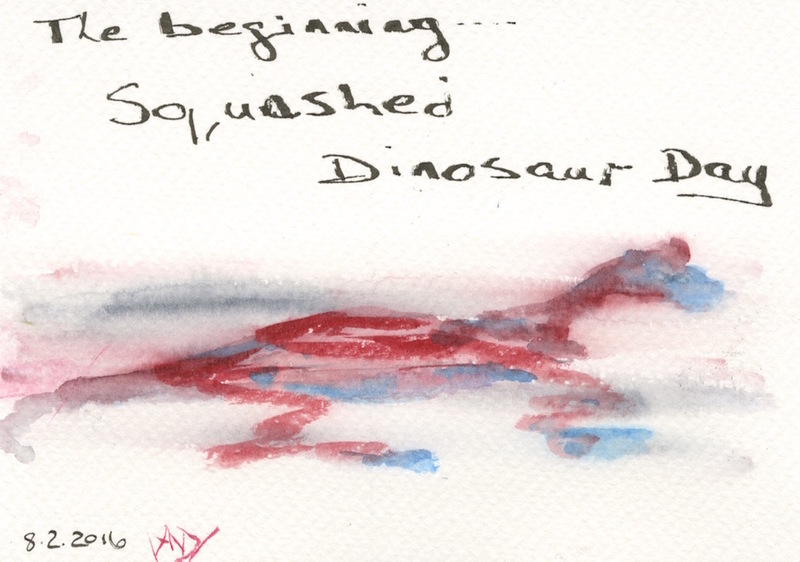 I had to start with a painting about a squashed dinosaur. I tried to capture a sense of ‘Squashedness’. Day 2 was a restless day. There was calm beneath, but my mind was leaping all over the place with new ideas. I blame the watercolour marks project. On day 3, I had a conversation about history and the way unforeseen events can change our direction. Events overtake intention. Day 4 was about recurrence. The cat ended back at the vet (Horatio is an expensive pet right now) with a recurrence of his urethra problem. It was time to paint recurrence, and end the week with the thought that there would be a recurrence of abstract paintings in the coming weeks. Thanks Maudei. That’s my favourite out of this bunch too. It is a bit scary sharing the ones I don’t like. But it doesn’t seem fair to only share the good ones. I know the feeling of getting stuck. But I also know it will lead to exciting new adventures. 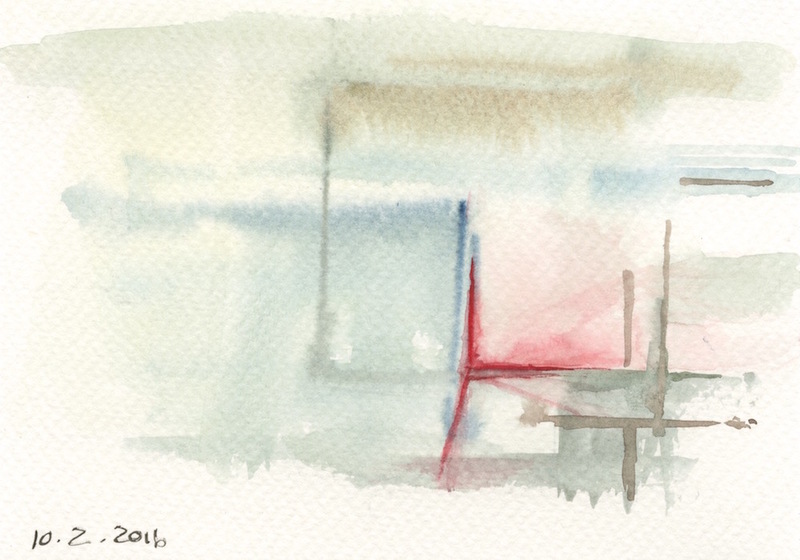 I love your idea of painting one abstract every day, and I love the results! Can’t wait to see the next ones. Some aren’t so great, Judy. The wildly experimental ones do go badly wrong sometimes, but that’s all part of the learning. I’ll be interested to see which ones people really like as it progresses. Hi Sue. Glad you found this useful. I’m not sure what Beverley Wells is doing at the moment, but I’m talking about is developing a unique way of expressing myself on paper. Shirley Trevenna talks about it a lot. Its what defines and identifies an individual artist. I hope that makes sense. Ping me if not and I’ll try to explain better. Dear Vandy – so can relate. Finding it very difficult to paint anything meaningful. Think this is very inspiring to any who might be in that same place right now. Thanks for sharing. Hope you have a great day.